Today, Matthew Kipper is an exception. His exception used to be the norm. The recent Bloomington Jefferson High School graduate was a three-sport standout during a time when many student-athletes specialize in one sport. He excelled in football, basketball and track and field while graduating with a 3.5 G.P.A., receiving numerous scholarship offers, and being named the Jefferson High School Scholar-Athlete of the Year. 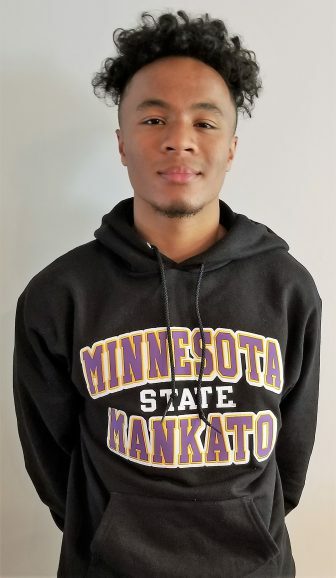 After considering the University of St. Thomas, St. John’s (Collegeville), Carlton College, Macalester College and St. Olaf College, Kipper chose to attend Minnesota State University-Mankato on a football scholarship. He plans to major in statistics. In addition to the football scholarship, Kipper also earned the Leo Lewis Foundation football scholarship, Jefferson High School Pride scholarship, an MSU-Mankato academic scholarship, and and MSU-Mankato leadership/diversity scholarship. The pictures and captions tell the rest of his story. Three-sport scholar athlete Matthew Kipper will attend MSU-Mankato to play football and major in statistics.